People have long looked closely to the gifts of nature, noting its direct impact on their health and well-being. It was noted that internal sensations of the body depend on weather changes, psychological state ranges of lunar activity and from precious and semi-precious minerals coming special energetic. People revealed gradually medicinal and magical properties of minerals, listening to their feelings and well-being. Today we have at our disposal unique observations, discoveries and research results that have come to us through almost a century. We know a lot about the properties of various minerals and have the opportunity to use them for our own purposes. Fuchsite mineral of bright emerald green color is not immediately received its present name fuchsite. Initially it was called as chromium muscovite, verdite and even gebhardite. Fuchsite is obtained in Brazil, California (USA) and Australia. Smaller deposits are located in Nigeria and Madagascar. Lithotherapists use fuchsite as a stabilizer of content of white and red blood cells. It prevents formation of open wounds and bleeding. For therapeutic purposes fuchsite is used and to improve the musculoskeletal system. It improves the mobility of the musculoskeletal system and is able to straighten the spine. There are known and magical properties of the mineral. Fuchsite stone offers its owner the way to practical skills and knowledge; it helps to learn more about the properties of herbs and herbal medicine. In addition, it reveals creative potential and brings material success. Fuchsite is used to get rid of negative impact, addictions or echoes of the old life. Mineral releases and of victim complex. 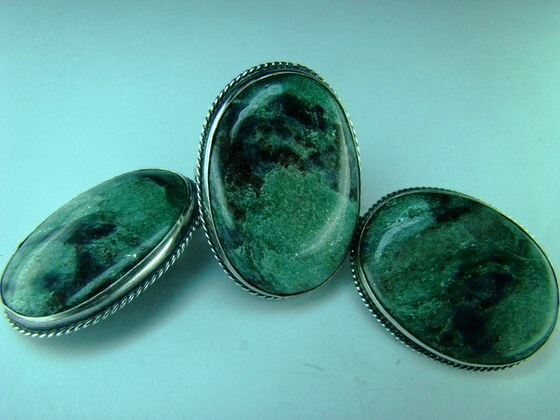 Stone fuchsite is ideal for such signs of the zodiac as Pisces, Libra and Aquarius. Brass-yellow or green-yellow mineral chalcopyrite is found virtually in all countries of the world. Sometimes it is called copper pyrite in the literature. Chalcopyrite is used as antimicrobial agent. And its anti-inflammatory properties are often used. Litoterapists is convinced that yellow chalcopyrite is able to have positive effect on the stomach, improving its functioning. Chalcopyrite is able to enhance the appetite and increases metabolism, which affects positively the well-being of the whole organism. 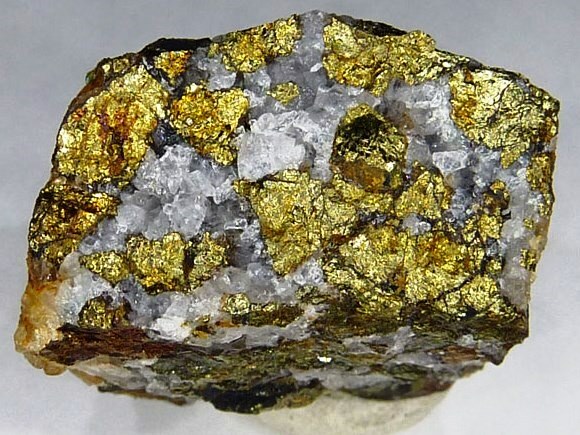 They use chalcopyrite and for the treatment of skin diseases, and stress, and nightmares. The magical properties of chalcopyrite mineral are still not fully understood. In practice, chalcopyrite is used to attract good luck and profit in trading. It’s argued that the mineral promotes better dive into a meditative state. In addition, chalcopyrite helps single women find loved one, and create a happy family. What about zodiacal preference of the rock scientists have nothing to tell concrete. Name of bluish-green mineral chrysocolla is literally translates as “glue for gold”. Lightweight and quite fragile stone is known since ancient times. 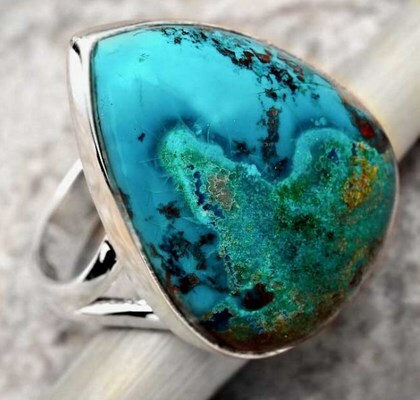 For example, chrysocolla was used as jewelry even before the Inca, and chrysocolla came in the history of ancient Israel under the name “Eilat stone”. Chrysocolla is most often used to treat common diseases affecting women. Litoterapists believe that chrysocolla crystal can also help with bronchitis and many colds. It will be useful for all those who are plagued by chronic cough or other diseases of the throat. Moreover chrysocolla has great healing effect on the functioning of the thyroid gland. People use not only healing properties of the rock, but its magic power. It is believed that chrysocolla mineral helps to understand better life around you, discover the world for yourself. Amulets of the stone ward off evil spirits, fears and illusions that prevent to live. Chrysocolla affects actively women in magical sense, developing the instinct of motherhood in them, presenting its owners’ tenderness, femininity and sophistication. In zodiac terms chrysocolla is recommended for Taurus and Scorpio. People who are born under these signs, using the mineral will gain wisdom and developing intuition. Brilliant emerald gem is mined in Kenya, Germany and Tanzania. 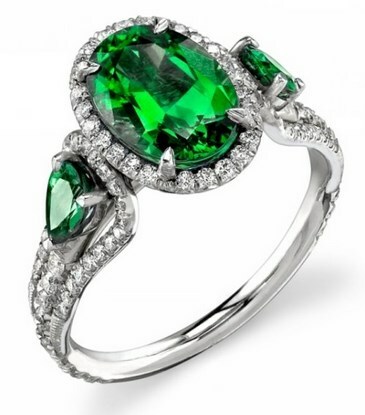 Tsavorite is considered young gemstone. Unusual mineral got its name in 1974 thanks to the president of the world famous jewelry company Tiffany & Co. Gentle pleasant color range of tsavorite gem is a great sedative. It balances the internal state of its owner, brings harmony and inner peace in his life. It is believed that tsavorite protects against all negativity that can come from the outside world. Concerning family tsavorite serves as stone-conciliator, which will contend with internal divisions. Medicinal properties of this mineral are disclosed in the stabilization of the pressure and help meteodependent people. In astrological terms tsavorite stone is ideal for such signs of the zodiac as Pisces and Cancer, although as a talisman the stone will not hurt other representatives. Zoisite was discovered for the first time only in 1905. However, the stone gained quickly popularity thanks to its healing properties and green color. Zoisite is used for prevention of the cardiovascular system diseases, normalizes blood pressure and facilitates its owner’s state of health. 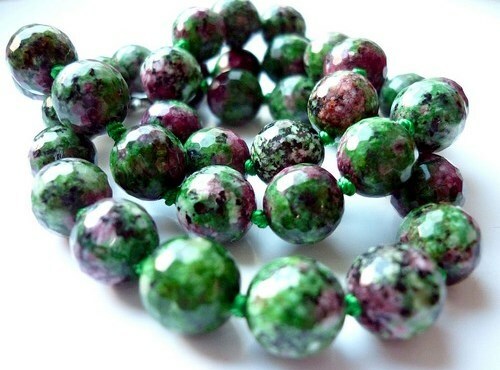 Zoisite relieves colds and eliminates headaches. Litoterapists argue that zoisite is useful for meteodependent people. Stone improves metabolic processes in the body. Talking about the magical properties of the mineral, it should be said about the “family” of zoisite stone. 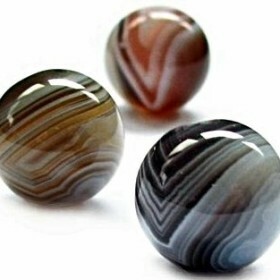 In particular, the gem improves family relationships and keeps the peace of the family hearth. Zoisite ring draws to its owner love and happiness. Also, sometimes it can give the necessary “acceleration” in making important decisions. Scientists are still not decided about the membership of zoisite to a particular zodiac sign. The name of the mineral “eudialyte” is translated from the Greek as “easily soluble” and its “popular” name – “Sami blood”. Stone is not common in nature – deposits are found only in Canada, Greenland and the Kola Peninsula. 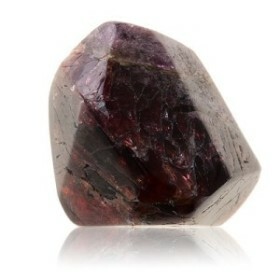 Eudialyte mineral is considered the best assistant in the fight with melancholy and hallucinations. In addition, the gem helps get rid of pancreatitis, stimulates the pancreas, improves blood. Some lithotherapists argue that eudialyte is an indispensable tool for reducing the intraocular pressure – just look a few minutes a day at the mineral. Meanwhile eudialyte stone has unique magical properties. Mineral is recommended to use as a mascot representatives of professions related to the risk. However eudialyte should not be worn continuously, it’s necessary periodically to give “rest” to the stone. 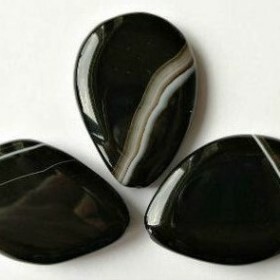 You also need to consider that moody gem is not combined with other stones. Eudialyte is perfect for zodiac sign Virgo.